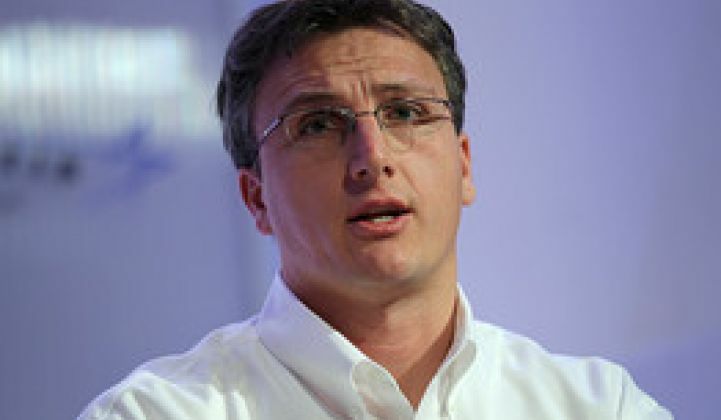 SolarCity CEO Lyndon Rive was interviewed by DBL Investors co-founder and SolarCity board member Nancy Pfund at the World Energy Innovation Forum at the Tesla factory in Fremont, Calif.
Nancy Pfund is a cleantech investor and energy subsidy historian with a hot investment hand. 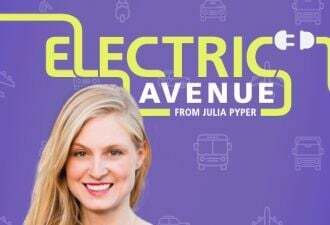 She's on the board of SolarCity and was also an investor in Tesla. She asked SolarCity co-founder Lyndon Rive to speak on a few topics at a bustling cleantech event in Fremont on Thursday. Love or hate the utility? Rive: "It depends on which utility. The part I don't like is when they try to stop progress." Rive called the utilities the "largest air polluters, water polluters and consumers of water." "When utilities put up obstacles -- that gets annoying," said the CEO, seeming to stifle stronger words than "annoying." He added that, "Some [utilities] do see the need to transform." Pfund rolled a video from a recent CPUC forum with Rive, Tesla CEO Elon Musk and CPUC President Mike Peavey in which Rive said that "innovation must not be constrained" and gave an example: customer interconnect for SolarCity's energy storage system takes an average of eight months, according to the CEO. And "hundreds" of SGIP program customers cannot connect, according to Rive. Elon Musk's reaction to news of this lengthy connection delay: "That's crazy." Yesterday, Rive suggested, "But you can't help but think that the behavior incentive is to delay the game." Rive spoke of "intentional roadblocks" from the utility, though he noted that "President Peavey has really helped with this." Rive insisted, "There is no extra complexity in interconnecting" a PV system with storage versus just a PV system. Peter Rive, the less publicly exposed SolarCity co-founder, wrote in a recent blog post that storage is where "solar and utilities can work together," in Pfund's words. "There is no death spiral" said Rive. "It's brought up by utilities to create fear." Rive said that there might be a "change spiral," and that "maybe change is death" to utilities. He said that solar combined with storage is a "forcing function" that solves the utility complaint that solar is intermittent and will bring grid instability. "When you add solar to storage, you solve all this." Rive suggested that utilities don't want to solve the problems, because solving the problem "means they lose control and the business model changes." Rive said that the subsidies and incentives for solar are "peanuts" compared to subsidies for fossil fuels. When asked about keeping the market "a level playing field," especially when SolarCity is demonstrating that it can live without incentives such as the CSI, Rive suggested that a level playing field for the fossil fuel industry means "that fossil fuels are elevated -- and you are not." Rive gave an example of the deeply embedded nature of fossil fuel industry subsidies: He cited section 105.2 of the Uniform Building Code which lists "work exempt from permitting." Included in this list are standard items like small tool sheds, short fences, small water tanks, minor sidewalk and driveway improvements, as well as slightly more questionable items -- such as oil derricks. That's right. An oil derrick does not require a permit. And there is no size distinction. Rive pointed out that without permit requirements, solar can get installed the same day instead of the two months it can currently take. A building code in which "a big frigging monster of a machine" does not require a permit and "is not called an incentive" is not a level playing field, said the CEO. Rive said it was "faster to get a permit for a fracking facility than it is for a solar system." He said that it won't be a level playing field "until external cost is realized." Rive spoke of Musk's ability to see "the invisible wall in front of you" and the necessity to "turn right" and drive through a few potholes in order to avoid the wall -- which is only visible when you look back to realize what you avoided. Rive said of his cousin, Elon Musk, "He is the chosen one." 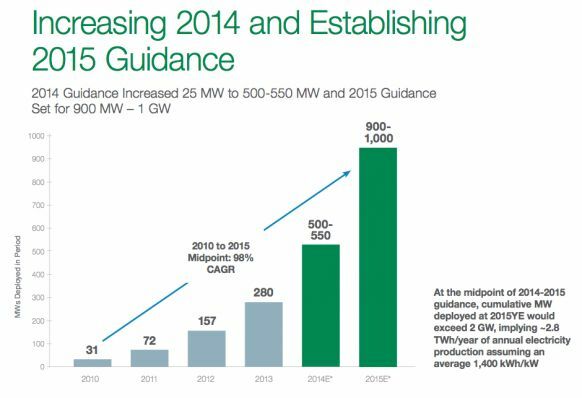 SolarCity increased 2014 guidance to 500 to 550 megawatts deployed and set initial guidance for 2015 with megawatts deployed of between 900 megawatts and 1 gigawatt. 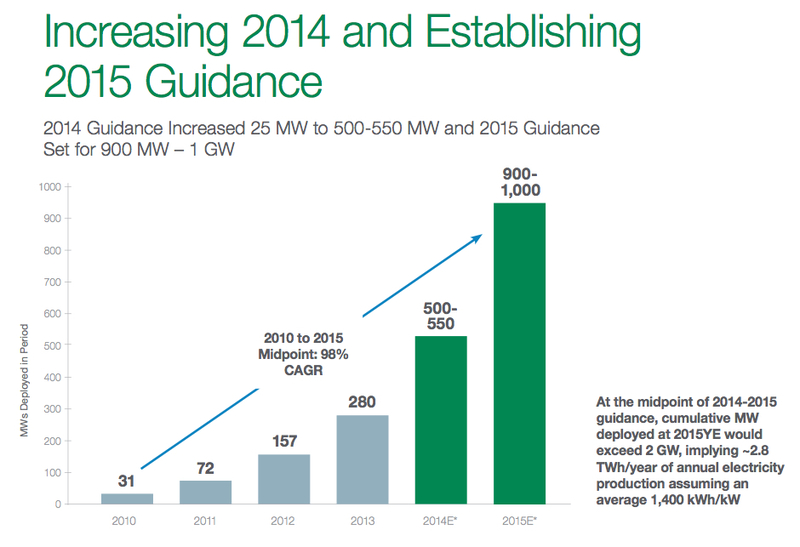 Guidance for Q2 2014 is 105 megawatts to 110 megawatts deployed. Deutsche Bank's Vishal Shah writes in an analyst note that SolarCity's "2015 outlook reinforces our view that growth in the U.S. residential market should accelerate into the 2016 timeframe, driving significant operating leverage in the model." He called the results a "big beat/raise" with a 2015 guidance "well above consensus." 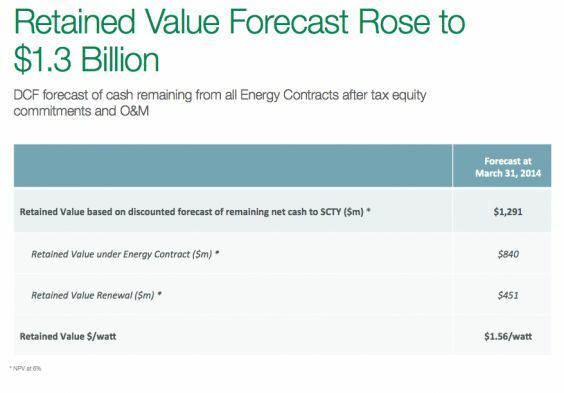 "Our contracted cash flow is now $2.5 billion. The amazing part is that we added $500 million in one quarter. These are starting to become big numbers. We also note [a cumulative total of] 100,000 energy contracts [as] we added over 17,000 customer contracts this quarter. We are well on our way to 1 million customers." "Now, we are not going to slow down; we are going to continue to invest in sales and marketing. Based on these investments, we are now forecasting 2015. The forecast for 2015 is going to be 900 megawatts to 1 gigawatt. The reason for giving you 2015 guidance this early is that we’ve got to make those investments now, and you will see this in the opex numbers. If we meet this forecast by the end of 2015, we will have over 2 gigawatts of deployed solar and a historic growth rate of 98% for the last five years. That will be an amazing achievement." "There are four main pieces of capital in the financial model. A construction revolver (which is $200 million today), tax equity funds, aggregation facilities and long-term securitizations. We optimized the cost of capital considering our investment activity in concert with the cash generated from operations which are predominantly our long-term contracts and the required financing. "Since the beginning of this year, in a little over four months, we have completed in excess of $750 million in financings. We upsized an existing aggregation facility to $158 million early in the year and entered into a new $250 million facility led by Bank of America Merrill Lynch. On the tax equity front, we closed three new or upsized funds, including a first-time investor, a Fortune 500 financial services company." Discussing the Arizona market: "Yes, the state itself has seen a decline in solar adoption. The state has had many negative things happening to it which have increased the cost to the customer. Unless you have significant economies of scale, it’s really hard to offer a customer value proposition that make sense, so it is a challenging state. Now, we do have economies of scale and our value proposition is still very attractive to customers. In fact, our bookings in Arizona have...never been higher. [Even] with all these difficulties, the only way to push through with extra fees and costs is to get more volume and to get more scale. We’re actually going to continue to invest in Arizona."